After ongoing investor testing and community engagement, we’ve created a new user experience built for your needs, the Marketlend Loan Exchange (Beta). When you access the new Loan Exchange you will notice a number of key differences to the existing Exchange. 1.We’ve added some Filters to allow you to more easily select loan parts for sale that meet your criteria (depending on the device you are using and the size of your screen the filters will either appear at the side or in a drop down at top of exchange list). 2.We’ve added some graphs to show the make-up of available loan parts on the exchange. The graphs are responsive to changes in the Filters. 3.You can now choose to Buy All parts or a specific number of available parts without needing to view individual parts. 4.Loan Parts for sale are group by Loan/Interest Rate/Premium-Discount value. 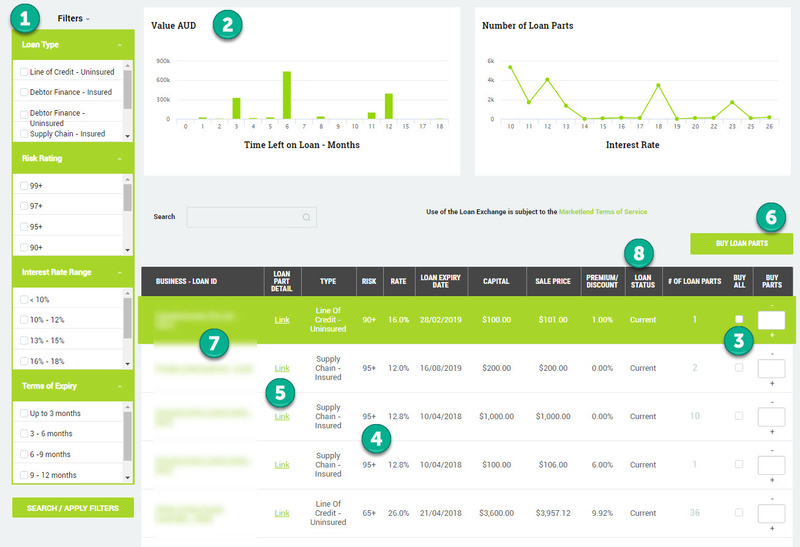 5.You can still view all individual loan parts for sale by clicking on the Loan Part Detail Link. 6.Whichever option you choose – Loan Parts are bought by clicking the BUY LOAN PARTS button at the top or bottom of the list. 7.You can view Original loan details and updated Commentary by clicking on the Loan ID link. 8.We’ve added a column to indicate the Status of the loan – showing whether the loan is Current or is in Arrears. If you need to cancel a Loan Part that has been put on the Loan Exchange for sale you can still do this from the Loan Exchange page. If you own any of the Loan Parts for sale for a particular Loan you will see that the option to select Loan Parts to buy is not available. To cancel any Loan Parts you just need to click on the Link to the loan part details. You can then choose which loan parts sales to cancel or select to Cancel All.